Are you any good at hiding how you feel? 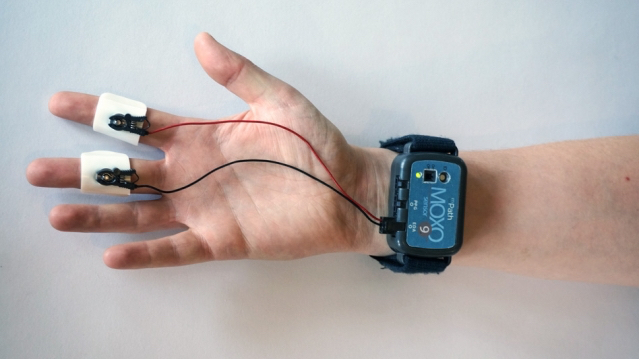 It wouldn't matter if you were wearing Moxo, a wearable sensor from MIT Media Lab spin-off mPath. Moxo measures changes in skin conductance (electrical changes across the skin) and works together with a pair of eye-tracking glasses, or GoPro cameras, to determine emotions in the wearer including stress, frustration and boredom. The startup calls the process emototyping - great word - which essentially consists of tracking changes in physiological arousal and the sympathetic nervous system. It's similar science to what we've seen cited by emotion sensing wearable startups over the past 12 to 18 months. So what to do with all this power? So far Colorado based mPath has worked in market research with brands like LEGO, Google, Best Buy and Hasbro. The eye tracking component means that, for instance, if a participant is shown a variety of products, the team can pinpoint exactly when their levels of interest starts and finishes. More interesting is Moxo's use in education, working with the Boys and Girls Club in the US. So, for instance, it can detect when a child is struggling to concentrate on reading by looking around the room. Plus in tests, founder and CEO Elliot Hedman says that they found that a treat, such as a game, before a reading task improved levels of engagement more than a reward afterwards.